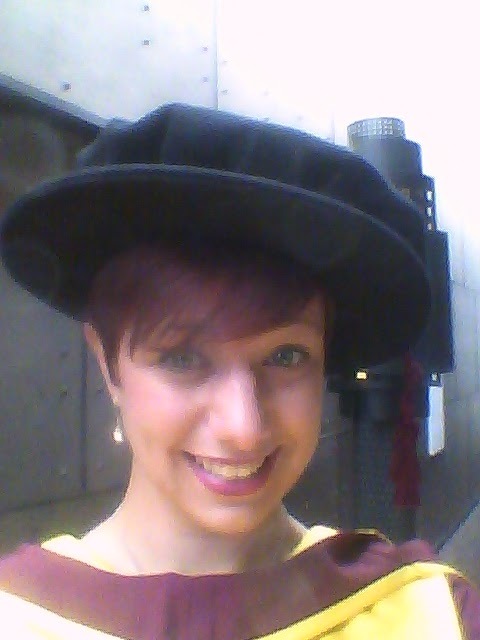 As this was once upon a time my PhD blog, I thought I’d reflect on it being three years since Graduation. If I’m honest it’s mixed emotions I feel looking at Graduation pictures. On one hand I’m still incredibly proud I made it to the end. Let’s face it for a long time it didn’t look likely. 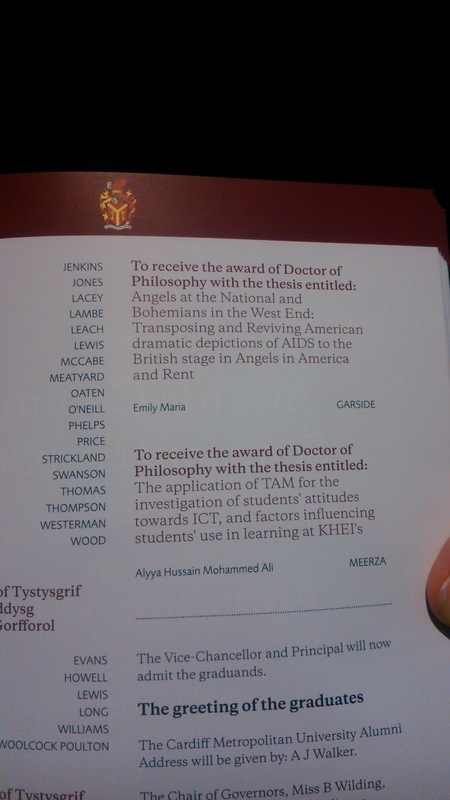 And people like me don’t get PhDs. Just getting to Silly Hat Day was an achievement. For a while I tried to hang on in academia. Doing an alt-ac role, it was well paid (the most I’ve ever been paid in my life in fact). And in another life I’d still be working in Alt-Ac jobs- after all it was what I was doing pre-PhD. But it was fixed term, and I was also miserable in that particular job. So I moved to a ‘lower level’ job in Arts Development. Also fixed term. One that ended quite bitterly for me, having been told my job no longer existed, only to see it advertised shortly after. It did exist, just not for me it seemed. That was last September, and since I’vein the Worst Admin Job Ever d) Temping as a medical receptionist in a Private Hospital. None of this is what I envisioned doing when I thought of my post-Graduation life. And honestly, looking at it that way, I feel like a huge failure. I came out of the PhD knowing I was never good enough to be an academic. And this broke my heart, because teaching at a University was the happiest I have ever been in a job. And I’d put my heart and soul into my research. And when you spend 4 years (sorry Twitter snobs, a lot of us spend 4 years) ‘training’ for something, and then can’t do it…it does break your heart a little. You have to readjust. I tried to hold on in academia. I went to a few conferences. I swore off them when I spent most of a wet miserable weekend in Belfast crying. And having the work my research was on torn to shreds by the keynote before I could give my paper. That’ll do wonders for your academic confidence. Then I was on a panel with a man who had, three years previous, Mansplained my own PhD to me in the form of ‘questions’ at the end of a paper. I sobbed, I went home. I swore off academic conferences for life. So I was done with the one thing I’d focused my life on, sacrificed most of my 20s to. And honestly I felt like I had no options left. Because here’s the thing if you start your PhD in say your early/mid 20s when lots do. You firstly miss out on a lot of life-living (a topic for a another blog) but your’e also anywhere between 4-10 years behind everyone else in their career path. While they’ve gone from entry level or Graduate job, through internships to working up the ladder…you’ve missed all that. And nobody, and I mean nobody gives a damn about transferable PhD skills from a Humanities PhD. And having just self-funded a PhD, with the view it was an ‘investment’ I’d gambled everything I had. I couldn’t just start again working for free. So I’ve spent 3 years scrambling from job to job. There’s been no plan, because well the plan has had to be ‘pay bills first’. And so, I feel a failure because on paper, I am. I work as a temp earning minimum wage and I do judge my self worth, and my success by this, however much I shouldn’t. Because no matter what else I might be achieving, we’re all conditioned to measure ourselves by our job title and salary. For the last five months I’ve stayed in my part time temp job. I’ve stayed in this job for a couple of reasons. Partly because I had a need to ‘hit pause’. After frantically looking for a job when my last ended, failing to do that. And then suffering a major blow at the hands of another job (here). I was done. Two years post-PhD and the juggle of the self-funded-never-ending PhD caught up with me. I could no longer lurch from one thing to another. And I was tired, so tired. So when I realised I had some temp job security, I decided enough was enough. Take the job you don’t have to think too hard in, that you leave in work at the end of a shift and just take a breather. Except of course I’m not. I took the breather to take a gamble. Take a gamble on whether I could make a go of other things. This is the side I’m proud of post-PhD. Because it’s the work that feels like ‘real’ work…but none of it I make a living off (though finally I’m getting paid for some of it). I’m hitting pause to work on several major ‘projects’ and juggling as a ever a few minor ones. Taking centre stage (or actually competing for it) are a play commission, and a book contract. Both things I’ve dreamed off since I was a child. On a good day I can believe that these are the start, that there’ll be other plays, and other books. On a bad day I say I’m deluding myself, throwing away chances for a proper job for a play nobody will see, and will lead to nothing, and a book nobody will read. On the bad days it feels self indulgent, that I have to justify it, like I am here. That I shouldn’t be allowed to. That I should just grow up and get a real job. I hold onto the fact that either way at least I’ll have done them. And I’d regret more not giving them a chance. The other secret is, and this is a guilty one: I’ve been really happy doing it. I love that I get a chance to dedicate to this. Even if it is exhausting- I regularly between day job and ‘real jobs’ am working 10-12 hours a day, 6 or 7 days a week. I went 6 weeks without a day off at all.But then there’s weeks where I’m able to only do ‘Day Job’ a couple of days…and I feel guilty for not working more hours. But if I work more hours, the other stuff doesn’t get done, and I feel guilty for just being stuck in the day job…and so on. But I’m happy. I don’t hate the day job like I have other jobs, because I don’t feel stuck in it. Because I can tell myself it really is a means to an end. And it feels like a real privilege to spend a few months again working on things I really love. But I still feel guilty. That I’m not doing enough, not achieving enough. I look at other people (even though I shouldn’t) who are further along their careers than I am (and always younger) who seem to get all the opportunities, who are in with the in crowd. And I feel like I’ll always be falling short, just like I was in academia. None of this is where I saw myself three years later when I Graduated. But to be honest I had no idea where that would be either. A friend of a friend once said that the real measure post PhD is where someone is in 5 years. And that in between there’s, well frankly a lot of crap was the summary I got. So maybe that’s it. Maybe wait it out a bit longer. 4. Implying we haven’t ‘paid our dues’ enough. Or worked. Or ever had a proper job. 5. Saying that more people fail than succeed. I’ve failed a LOT. I know. But excuse me if I want to spend 5 minutes being inspired by someone who didn’t. Finally, I want to acknowledge that I wouldn’t be writing this blog. I wouldn’t be doing a lot of things if it weren’t for the support of a lot of people. It might take a village to write a PhD but that village also keeps a lot of us going after. You know who you are. Thank you. Let’s see where we are this time next year everyone.